So you love chicken, yes I’m assuming that because…well who doesn’t? Over the years I’ve become more aware of the quality of the meats we eat and where they come from. These days it really matters to me what we are putting into our bodies and frankly with the chicken that is Canadian Raised I know where it comes from and how it is raised. When I’m shopping I look for the label which tells me that the chicken is raised in Canada by farmers dedicated to producing unmatched quality chicken that meets the highest nutrient, food safety and animal care standards. Chicken Farmers of Canada is an association of over 2700 chicken farmers in Canada who are dedicated to raising the high quality chicken we all know and love. With its 3 pillars (import controls, production planning and producer pricing), the supply management system for chicken continues to evolve to meet the changing demands of the Canadian marketplace while keeping it open to a predictable level of imported chicken as well. You can read more about Canadian Raised Chicken on the ChickenFarmers.ca website, understanding the Supply Chain will relieve any concerns you may have. If you’re like me, you’re on the lookout for fantastic chicken recipes to have on hand at any given time. I repeatedly return to the Chicken Farmers of Canada recipe section or their Instagram and Pinterest accounts for ideas. Recently, Sobeys has celebrated with the Canadian Raised Chicken label by creating a FABULOUS recipe box full of how-to videos, contests, information and recipes for folks who are cooking chicken. I love this section, it has me equipped for almost anything!! Before you head out shopping, download the FREE Shopping App from Chicken Farmers of Canada and simplify your shopping trip. The only free grocery list app that allows you to share lists and sync in real time. Coming in the next couple of weeks: a fully functional web-based interface for the app. Create your list at your computer, shop from your phone. 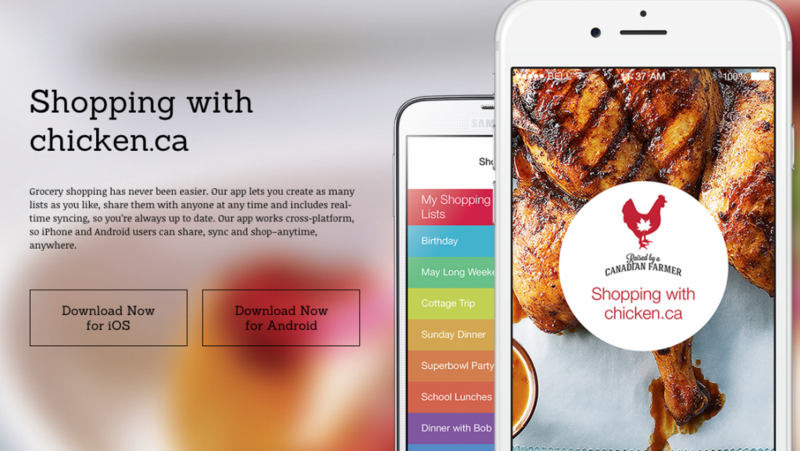 Search chicken.ca recipes right from the app and add them to your shopping list in one click. To celebrate the Fall season, Chicken Farmers of Canada has provided us with an amazing prize for you all here!!! 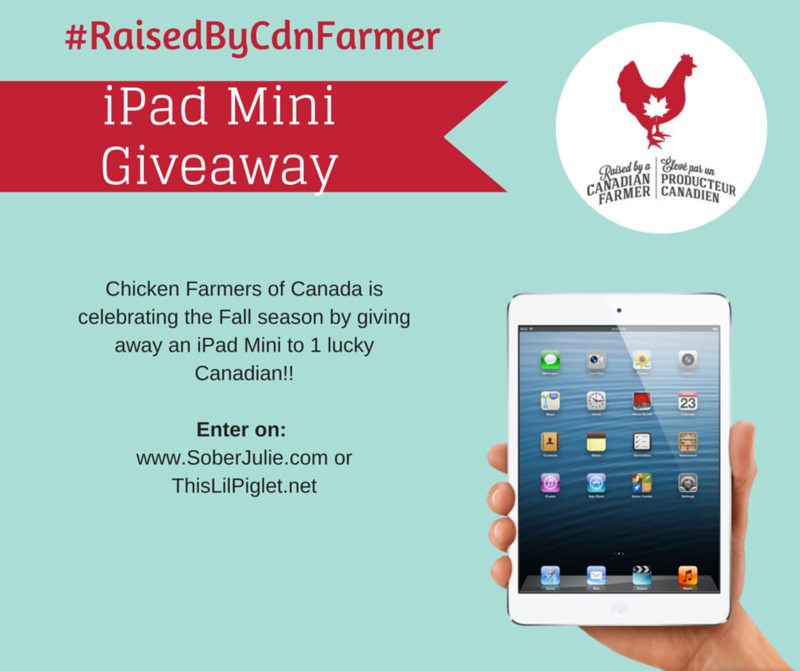 One very lucky Canadian reader will win an iPad mini to help you search for all those tasty chicken recipes and to help you create a grocery list!!! You must be 18 to enter, simply fill in the Giveaway Tools form below. Winner will be drawn on October 20th and will have 48 hours to respond. I love a simple 4 ingredient chicken bake dish. Chicken Parmesan is my all time fave! One of my favourite dishes is Chicken paprikash, yummm!!! Oh there is nothing better than chicken parm, smothered in cheese and tomato sauce, yum. My fave chicken dish is Tex Mex Chicken in the slow cooker. Just made Chicken Linguine Tetrazzini last night…Yumm! I love roasting a whole chicken! I love homemade fried chicken – not the healthiest, I know, but as an occassional treat – it’s delish! My fav chicken dish is Chicken Parm but only if my hubby makes it, no one makes it like he does. Crock Pot Sriracha Chicken. So yummy! I made a BBQ shredded chicken in the crock pot the other night that was delicious. Most of my meals contain chicken,….I’ve had some bad chicken and tough ones, but, like you, look for local products with a clean raising ethic. I can’t possibly choose one! We eat chicken 95% of the time for dinner. I love a coconut curry chicken. BBQ’d honey lime skewers, a roasted whole chicken and OMG beer can chicken!! i love chicken thighs – my favourite recipe to make is The Thigh Who Loved Me from The Looneyspoons collection. Honey Garlic chicken stir fry! YUM! Although I prepare chicken many different ways our favourites are whole chicken cooked in the slow cooker and chicken pot pie. We also really love Hurry Chicken from Simply Stacie. I love roast chicken with all the fixings this time of year! My favourite chicken dish? Has to be old fashioned BBQ chicken with a side of either baked potatoe or garden salad! Our fav chicken dish is roast chicken with gravy and all the veggies! My favorite is chicken in the crockpot with a cream & white wine sauce with rosemary. Teriyaki Chicken is my favourite chicken dish. My favourite chicken dish would have to be chicken parmigiana! Chicken fajitas is my favourite chicken dish! My family loves build-your-own chicken wraps, but personally, I prefer chicken breasts baked in a yummy creamy mushroom sauce, served with rice and brocolli on the side. Delish! Casey’s Restaurant has an awesome cashew chicken stir fry. I just love it! Roasted Chicken is my favourite! We love chicken Caesar wraps, especially in the Summer with the chicken cooked in the microwave. My favourite chicken dish is roast chicken with roasted veggies. My fave chicken dish is Thai curry chicken on rice. I actually made it for dinner last night. There is nothing I love more than dry chicken wings with hot sauce on the side, I could eat them ALL day! There is nothing lie a good ole roast chicken dinner with stuffing and veggies and lots of gravy and cranberry sauce. It’s hard to choose… but I think I have to go with chicken piccata. My favourite is breaded chicken by itself cooked in the oven. My favorite Chicken dish is roasted chicken. Chicken Stir Fry with all kinds of veggies and chicken chunks with Teriyaki sauce. Love homemade chicken vegetable soup, especially now that it is starting to cool off. I love Chicken Pot Pie the most! i love home made chicken fingers with buffalo sauce -Yum! I love chicken parm or a lovely stuffed chicken breast! What the heck, I love all chicken dishes. Also, I think I forgot to wait until I can submit for of the entries and prematurely submitted enter. 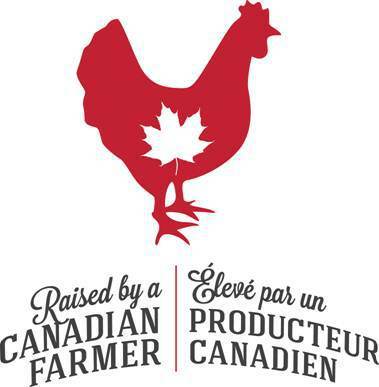 I am follow @chickenfarmers on Twitter! My favourite chicken dish is chicken on rice with cream of mushroom soup poured over it as a sauce. My favorite chicken dish is an awesome Chicken stir-fry. My husband makes this Chicken Peanut Szechuan recipe that is so popular, even The Kids will eat it! My favorite way to enjoy chicken is dressed and roasted the veggies and gravy. My favourite chicken dish is a chicken stir fry. My favorite is BBQ chicken. Chicken parm you taste so good! I love chicken & mushroom puff pastry! Baked chicken with basil feta sauce on top. Yum! My favorite is my husband has mastered making chicken shawarmas! I love a simple yet delicious whole roasted chicken. Soup made in the crock pot! My favourite chicken dish is when it is done on the BBQ with my homemade marinade. My favourite chicken dish is butter chicken. My favourite chicken recipe is Chicken Cordon Bleu. Delicious! My favourite chicken dish is butter chicken! My favourite summer chicken dish is chicken breasts barbecued by my dad – he makes the best BBQ chicken!! My favourite winter chicken dish is a Thai dish, chicken with cashews – so delicious! My favorite dish is definitely Butter Chicken! Lately, I have been absolutely rocking home made, seasoned chicken tenders. I do them up in a sauce or dry rub. It’s everything good about chicken wings, and so much more. Mediterranean Chicken is our favourtie! Stuffed chicken. Stuffed with anything. Grilled marinated chicken breast is my favourite! This looks like a great app! I love General Tao chicken !! Too any to choose, so I will just say roast chicken. We made a yummy chicken tetrazinni for dinner tonight! Chicken is a must about 2-3 nights a week for us. My fav dish is chicken kiev! Chicken cordon bleu is my favourite dish! My favourite chicken dish is Chicken Divan. I have to say your one pan Chicken has risen to the Top of our Faves. Also nothing beats a Roast Chicken Dinner! Another Fave of ours is Jerk Chicken. Gahh So Many chicken dishes we adore. My fave chicken dish is an oven roasted chicken with veggies! We love to make chicken STEWP here. Which is a thick stew over mashed potatoes. Tandoori chicken is my fave! Chicken teriyaki on the bbq! My all time favourite chicken dish is Chicken parmigiana. I love it with a side salad and fresh garlic bread. My Husband is a great cook and prepares a perfect dish! Thank you for a great post and giveaway! Good luck all! I love a simple bbq grilled chicken with sweet potato fries with aioli! My Mom’s chicken and cream of mushroom with rice in the slowcooker recipe. OMG D’Licious! My fave is chicken fried rice, I love it! My favorite chicken dish is Chicken, brocolli and cheese casserole. It is my comfort dish. And home cooked with love makes it even tastier! My favorite chicken is chicken stuffed with broccoli and cheese. I marinate chicken breast pieces in Kraft’s Sun-dried Tomato & Oregano & then BBQ it – delish! My favorite chicken dish is diced almond chicken . It tastes beautiful! Crockpot chicken with a bottle of Kraft garlic parmesan with roasted cauliflower and the juice of a lime. Everyone loves this meal so much there is never any leftovers for lunch the next day. Yummy. Hmmm, that’s a hard one as I like so many. I guess chicken parmesan for one in the toaster oven. Lately I’ve fallen in love with making boneless chicken wings. You roll the chunks of chicken breast in whatever seasoning you want, and then bake them. Healthier than normal chicken wings, and delicious! We are loving chicken thighs wrapped in bacon! Or beer can chicken on the BBQ! BBQ chicken with mashed potatoes and corn! Yum! Chicken and broccolie pot pie made with pie crusht! This is my famileys fav!!! Chicken, mushrooms, broccoli, and cream of mushroom soup over rice! My favorite is fried chicken! I make some wonderful breaded chicken cutlets. The leftovers are great for sandwiches, lunches. I love Jamie Oliver’s Hit and Run Panbaked Chicken – definitely a fave in our home. Thanks so much for this chance to win and good luck everyone! I love baked chicken quinoa. My favourite chicken dish is Chicken Fettuccini. My sweeties Butter Chicken. Thank you the chance to win. Butter chicken is my favourite! It’s got to be good old southern fries chicken! King pao chicken is my absolute favorite! In fact, I’m craving it now ! I enjoy a simple roasted oven chicken, with just a little bit of salt and pepper. So good! I love to make a chicken with Cashews on a bed or rice in a savory sauce. Our favourite is Classy Chicken from the Best of Bridge cookbooks. Chicken pot pie is my fave. My favourite chicken recipee is cast-iron fried chicken fingers breaded with ketchup chips. It’s actually a pretty good substitute. My mom makes the best paprika chicken with egg noodles and now I make it too! I love curry chicken & chicken cacciatore. This year my husband & I are on our own for Thanksgiving & I’m going to tried my hand at tur-duc-ken, with oyster, andouille sausage & cornbread stuffing. I’m excited! chicken thighs fried in butter with steamed broccoli is my favorite chicken dish. Low Carb Baby! My favorite chicken dish that I make is buttermilk garlic fried chicken ! I love chicken alfredo and chicken fajitas. My favorite chicken dish is chicken parmagiana! Love it! I love chicken pot pie! My favourite chicken dish is lemon rosemary chicken. I really like chicken fajitas. I love chicken , I dont any red meats so I have tons of chicken recipes. It is tie though I love homemade chicken pot pie , chicken nachos, and Triple Chicken with a bbq sauce base pizza. Homemade chicken and dumplings, my hubby’s birthday dinner every year, and a family fave ll winter long. Roasted Chicken with tons of root veggies. I have so many favourites! I think my favourite is butter chicken! I love chicken fajita’s . Love that we can all make them as we like a great versatile dish for everyone. All time favourite? Chicken Parmigiana – Brooklyn style (pounded thin). Yum!! More recent favourite? Chicken enchiladas. Thanks, Julie! I’m a huge fan of chicken parmesan. I love it! That’s a tough one, but BBQed chicken breasts and homemade chicken strips are always huge hits here! Chicken Parmesan is my favourite chicken dish. My kung-pao chicken stirfry is my family’s most requested recipe. My fave with my girls is our very own family recipe of sweet and sour chicken with rice. I love chicken breasts with bbq sauce :) Very simple! any kind of marinated chicken! My favourite chicken dish is roasted chicken. I like a LOT of chicken dishes, but a well roasted chicken, with crackly skin, moist meat and perfect seasoning is top of my pile for favourite things to eat. I love “Best Baked Chicken & Sauce” my Mom won the state of Pennsylvania Chicken Cooking Contest with this recipe.it’s AWESOME! My favourite chicken dish is Julia Child’s Supremes de Vollaile aux Champignion. So much yum!